I really cannot exaggerate the beauty of the surroundings we find ourselves in at the Mars Desert Research Station. I grew up in southeastern Utah, so I might have expected to be inured to it—but really, it is just phenomenal. During yesterday’s EVAs, we got to see a lot of the stunning sights, and local geology, first-hand. 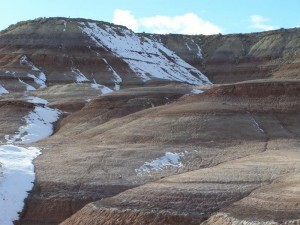 The Hab sits in the Brushy Basin member of the Morrison Formation, from the Jurassic period. These rocks were formed from freshwater lake sediments, with occasional volcanic ash deposits. The colors in the resulting claystone, mudstone, and siltstone are just phenomenal—bands of rich red, cream, brown, yellow, and purple. Atop these bands lies pieces of the Dakota sandstone that you can just make out in the background hills in this picture (click to see larger version). Yes, that’s snow! We’ve been enjoying simply beautiful weather since we arrived: sunny, clear skies and temperatures in the upper 30’s to low 40’s during the day. The snow fell during the previous crew’s final days and remains on the north-facing slopes. More snow is forecast for tomorrow; I’m hoping it skips us, so that the rocks and formations remain in clear, brilliant view. 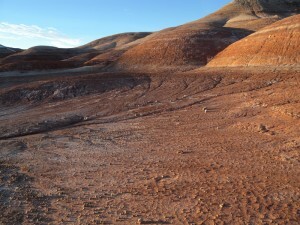 Yesterday during EVA #2, we walked north from the Hab across very slippery red mud and clay. Daytime temperatures do get high enough to melt snow on the south-facing slopes, and it runs off the hills, both soaks into the soil and depositing the fine-grained mud layers we were walking on. We left giant bootprints in several areas, and skid marks where it was slipperier than it appeared. We also crossed some cracked mud areas where water had evaporated, and the “popcorn” surface created by smectite (a clay) when it dries out. At left is one of the meandering channels flowing from the foot of the hills out over the muddy plain. As the sun dropped in the sky, the shadows from every rock and pebble were highlighted, giving dramatic relief to the surface and emphasizing the angularity of the rocks. These rocks mostly come from the overlying Dakota sandstone, which is coarser-grained and more resistant to weathering than the soft mudstone and claystone of the Morrison Formation. 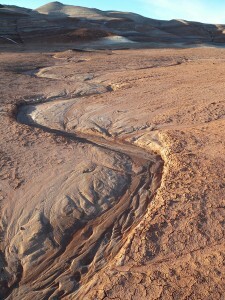 The Dakota sandstone is the remnant of an inland ocean, so it arises from a very different water environment than the Morrison Formation does. We are told that this layer contains regions with coal, petrified wood, and bivalve fossils. We haven’t found these yet, but we hope to explore the Dakota more extensively in a future EVA! To the left is a picture of an outcrop of Dakota from EVA #1 (which explored the region around Phobos Peak). Its greater resistance to weathering is evident in how this large block rests on an undercut layer of Morrison supporting it. And finally, we used the rock hammer to collect a sample of a layered piece of Dakota that may possibly have some endoliths growing on it. We also reached a large chunk of Dakota sandstone at the base of Olympus Mons during EVA #2 (see right). Although at an entirely different location, it shows the same differential erosion. 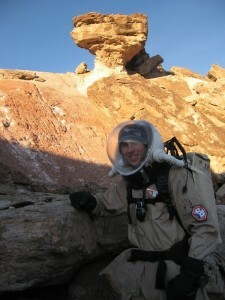 That’s Crew Astronomer Mike posing in front of the rock in his EVA suit, with our crew 89 patch on his arm. Thanks go to all of our crew for their great EVA work yesterday and the photos and stories they brought back! We’ll have another geology-oriented EVA coming up soon. Wishing you a very Happy Birthday and best wishes for the coming year. Wow! What a great way to celebrate your 21st birthday. You were on Analog Mars on your 21st birthday. How cool is that? I heard that blowing out the candles was spectacular The email later from Mission Support was even funnier… dont have flames near powdered sugar suspended in air I am busting out laughing. I would create a quick guide checklist with those instructions for future crews. Happy Birthday and also looks like you had a great EVA working on the Radio Telescope. Well done. Oh my gosh am I jealous! This just sounds fantastic, and your descriptions are wonderful! Hope you’ll have more great days to come and lots of fun! I’m so excited for all of you! The geology of the area sounds fascinating, a worthy substitute for Mars. Thanks for all of the great pictures. I’d love to hear more about other mundane details – cooking, eating, cleaning, sleeping, putting on your space suits, planning each day’s activities – and in particular anything that approximates what it might be like to live on Mars! Thank you for the posts and pictures. 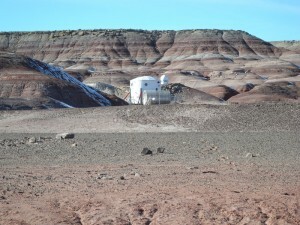 Before the mission started, I read the general documentation for the MDRS, of course, and would savor additional insight about the mundane “life maintenance” and Hab upkeep activities. There are several fossil sites marked on the big trail map. 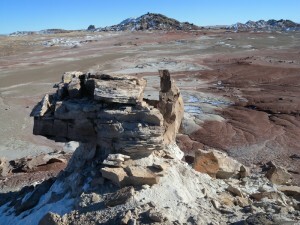 A couple of them are on Radio Ridge, southwest of the hab, where there are piles and piles and piles of fossil shells. We also found dinosaur bones. I’m loving your updates and it sounds like Darrel is going great guns on fixing the plumbing. Well done! Keep up the good work!